Brazilian Jiu-Jitsu (BJJ) is a grappling-based martial art whose central theme is the skill of controlling a resisting opponent in ways that force him to submit. Due to the fact that control is generally easier on the ground than in a standing position, much of the technique of Brazilian Jiu-Jitsu (BJJ) is centered around the skill of taking an opponent down to the ground and wrestling for dominant control positions from where the opponent can be rendered harmless. Mitsuyo Maeda was one of five of the Kodokan's top groundwork (newaza) experts that judo's founder Kano Jigoro sent overseas to demonstrate and spread his art to the world. Maeda had trained first in sumo as a teenager, and after the interest generated by stories about the success of Kodokan Judo at contests with other jujutsu schools that were occurring at the time, became a student of Jigoro Kano. Maeda left Japan in 1904 and visited a number of countries giving "jiu-do" demonstrations and accepting challenges from wrestlers, boxers, savate fighters and various other martial artists before eventually arriving in Brazil on November 14, 1914. In 1917 Carlos Gracie, watched a demonstration by Maeda at the Da Paz Theatre and decided to learn judo. Maeda accepted Carlos as a student and Carlos learned for a few years, eventually passing his knowledge on to his brothers. 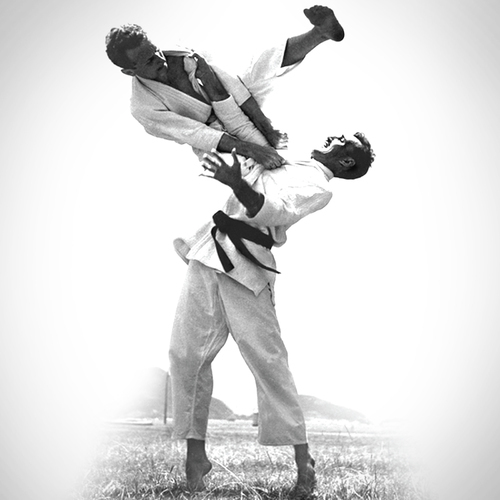 Sibling Hélio Gracie gradually further developed Gracie Jiu Jitsu as a softer, pragmatic adaptation from judo that focused on ground fighting, as he was unable to perform many judo moves that require direct opposition to an opponent's strength.